In this detailed review, we look at the Infiniti Pro by Conair Spin Air Rotating Styler, which is a dryer, straightener and curler in one easy-to-use piece of beauty equipment. With the varied heat settings, you’ll be able to deliver the right amount of heat to your hair. This is perfect for those with fine, treated hair as well as coarse hair. With coarse hair, it’ll take a bit more heat to deliver the shiny, smooth results that you want. In other instances, you might want to use a lighter heat or no heat at all. The Infiniti Pro also allows you to use the directional spinning brush or keep it stationary. This gives you an incredible amount of freedom in order to create exactly the style that you want. 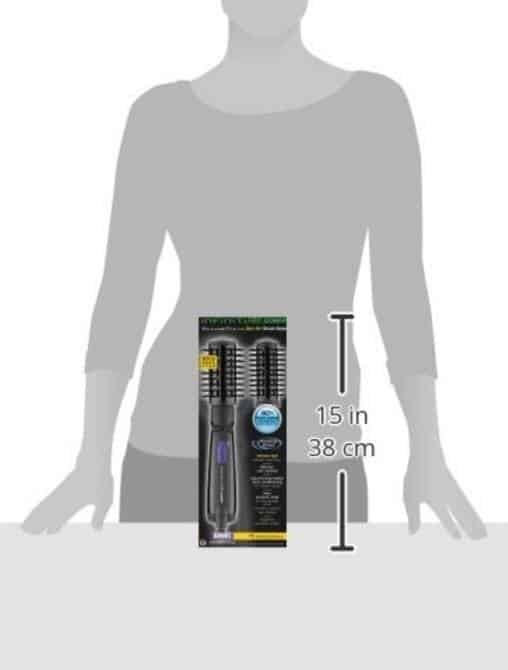 While the handle of the styler is huge, it’s incredibly comfortable for long styling sessions. When you section each piece of hair and straighten, smooth in one inch sections, it can take some time to do your entire head of hair. Your arm and hand won’t be overworked with this air brush. The two-inch brush spins in two different directions to give you more styling capabilities than ones that don’t spin at all. When the ceramic plate runs across each strand of hair, it smooths and creates a silky texture. This is great for hair that is coarse or baby fine. The brush will not rotate if it’s on the cool setting, which gives you a stationary brush when you need one. The bristles are static-free and tangle-free, so you won’t have to worry about hair becoming stuck in the rotating brush. At the same time, you will need a few minutes to get a handle on how the brush rotation works. It’s easy to get confused about what direction the brush should go. When you remove the brush from the box, you’ll need to plug it in to start using it. There’s no need to charge the brush or leave it to heat before using it. Dry your hair close to 80 percent dry before using this hot air styler. The motor doesn’t produce enough hot air to fully dry a person’s hair from soaking wet to completely dry and styled. At some point in the process, it’ll be time to add a product. This is a choice you’ll have to make. You might add some mousse while your hair is wet, or a styling product while it’s slightly damp. At the end, you can also use a bit of hair spray. It’s your choice. Once you’ve partially dried your hair, it’s time to touch it with the hot air brush. Section into parts so you can add one inch sections to the brush. If you’d like to see more volume in your hair, you can spin the brush close to the scalp while running the hot air. The direction of the spin will influence the way your hair will fall. You’ll need to experiment with what works for you. The Infinity Pro is 500 watts, and is compatible with the U.S. voltage system. If you’d like to use it in other countries while on vacation or because you live there, you can buy an incredibly inexpensive adapter. It’s always great to see these brushes in action. With this video, you can see she doesn’t try her hair a lot before using the brush. She actually uses the rotating styler as her drying system then she uses a straightening iron on top of this. Your hair’s needs will vary depending on whether you have fine, coarse, straight, or curly hair naturally. The styling brush has two buttons to rotate the brush forward or backward. This allows you to customize the type of waves and curls you’d like to set into your hair. If you rotate the brush underneath the hair, you create volume near the scalp and curl under depending on the way your hair is layered. With the brush turning the opposite direction, you’ll get beautiful flips in the ends of your hair. 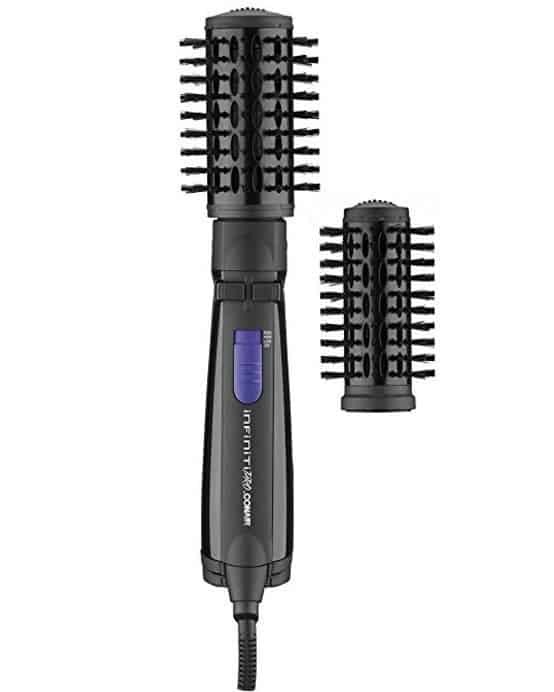 The Infiniti Pro by Conair is a combination brush that provides you with a way to get shiny, blowout curls and waves without the cost of a salon visit. The day you pull this out of the box and remove the protective cover is the day that you’ll say goodbye to expensive blow-dry visits. The tangle- and static-free bristles are perfect for long or short hair styles, and you’ll be pleasantly surprised, and maybe even in awe of the way this brush works in your hair.